Following in the footsteps of the award-winning Pentax K-3 DSLR, the K-3 II promises the highest image quality for DSLR users, complete with a newly developed Pixel Shift Resolution System and enhanced shake-reduction mechanism. 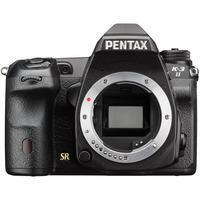 The Pentax K3 II is designed to be compact and manoeuvrable, offering easy operation and a swift response in the field. It features an APS-C-size CMOS image sensor with 24.35 effective megapixels; an AA-filter-free design for high-resolution image reproduction; a high-performance 27-point AF system; high-speed continuous shooting at 8.3 images per second; and a dependable dustproof, weather-resistant construction ideal for capturing shots outdoors. GPS, USB 3.0, External Power Supply Terminal, External Release Controller Terminal, X-Synch Socket, HDMI Output Terminal (Type D), Stereo Microphone Input Terminal, Headphone Terminal.